Make sure you have a happy healthy companion, and treat your panting pup with Stronghold Small Dog Brown 3. Why do reviews keep saying it doesn't cover ticks, when it has ticks listed in one of the many things it prevents? Does it or does it not? The only tick Stronghold claims to work against is Dermacentor variabilis, the American Dog Tick. The label warns that in heavy tick infestations, complete tick efficacy may not be achieved after the first dose,so an additional dose may be given two weeks later, with monthly dosing continuing after that. That's why we recommend a stronger product like Advantix or Bravecto for extensive tick prevention. 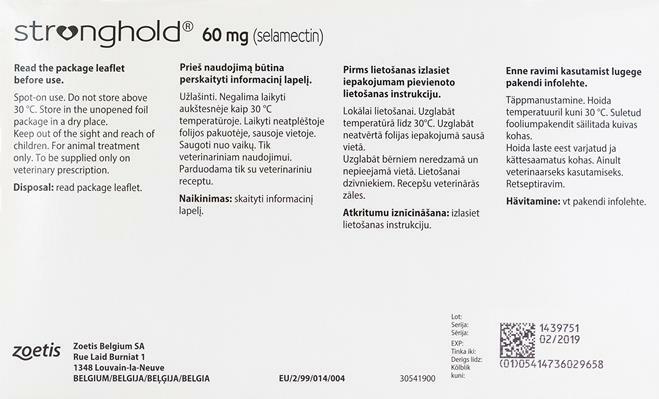 As well so many other parasites, Stronghold is a heartworm preventative but it doesn't treat, If your dog already has heartworm. Therefore it would be advisable to test your dog if he/she has heartworm before start to use it. We can't change the product on the automatic order, however you can cancel your Revolution from the website (my account) and re-order Stronghold. How do I make payment for Stonghold? You can place your order with a Visa or MasterCard online or by phone. Can Stronghold or Revolution be used on puppies 7 weeks of age? You can use relevant Stronghold and Revolution products on puppies 8 weeks old upwards. I've always used Stronghold Brown on my boy (an 11 pound miniature pinscher). This product is very efficient at keeping off/ killing fleas. I use it about every other month, at the MOST (it lasts longer than it's given credit for). No fleas....ever!